The Greatest Bull Market of All-Time? How many hedge fund managers would kill for the following performance characteristics over a 40 year time frame? On an absolute and risk-adjusted basis these numbers are ridiculous. Steady returns with about one-third of the historical volatility seen in stocks. Very few — and shallow — drawdowns. It was up nine out of every ten years. The bond bull market has been about as good as it gets for almost four decades now. It’s hard to imagine a better run for such a prolonged period of time. I’m sure you could make a case for the Japanese stock market in the 70s and 80s or U.S. stocks in the 80s and 90s, but nothing compares to the longevity of outstanding performance that bonds have enjoyed in the falling interest rate environment we’ve seen since the early 1980s. 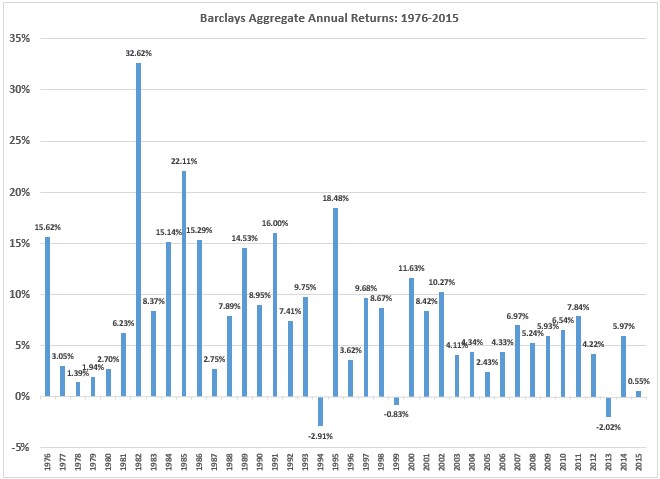 Returns were far lower and there were more down years (although the size of the drawdowns were still fairly similar). Volatility was actually lower, but that’s because the majority of volatility in the past 40 years was to the upside. I probably sound like a broken record here, but it’s important for investors to reduce their expectations for future fixed income returns. The next 40 years aren’t going to look at all like the last 40. Expect plenty of bond substitute products out of the fund industry in an attempt to add yield to portfolios. Wall Street will be bombarding the coming wave of retiring boomers with income-based products with promises of higher yields. Starting yields will get you very close to long-term returns over time in bonds, but my guess is we’ll see more volatility than in the past. Central bank intervention, investors with shorter time horizons using longer-term securities, high frequency traders, information overload and the ease and low cost of trading almost guarantees it. The biggest risk to bond fund returns that very few people think about these days is higher inflation in the future. Higher inflation would present a far higher risk to bonds over the long-term than rising interest rates in my mind (although both would likely occur together). Even with lower returns, high quality bonds can still serve a purpose as a hedge against stock market turmoil. For a simple 50/50 portfolio made up of stocks and bonds, a few percentage points in bond returns isn’t going to make a huge difference during a stock market crash. If stocks fall 40%, a 50/50 portfolio that sees an 8% return in bonds will fall 16% while a portfolio that sees a 3% return in bonds will fall 19%. Fixed income can still act as a portfolio stabilizer. Are Long-Term Bonds Worth the Risk?